Joe, for whatever reason, is determined to make a bloody mary that he honestly enjoys, despite agreeing that nobody is excited by savory cocktails and that the bloody mary may be beyond saving. At best, in my opinion, tomato drinks taste like spiked, soupy salsa. At worst, they’re retch-inducing. Yet Joe tries to not only make these drinks palatable, but to make them great. His measure of success is whether or not we’d want to mix the drink twice in a night. This time it actually happened! Shake over ice and strain into a cocktail goblet filled with fresh ice. 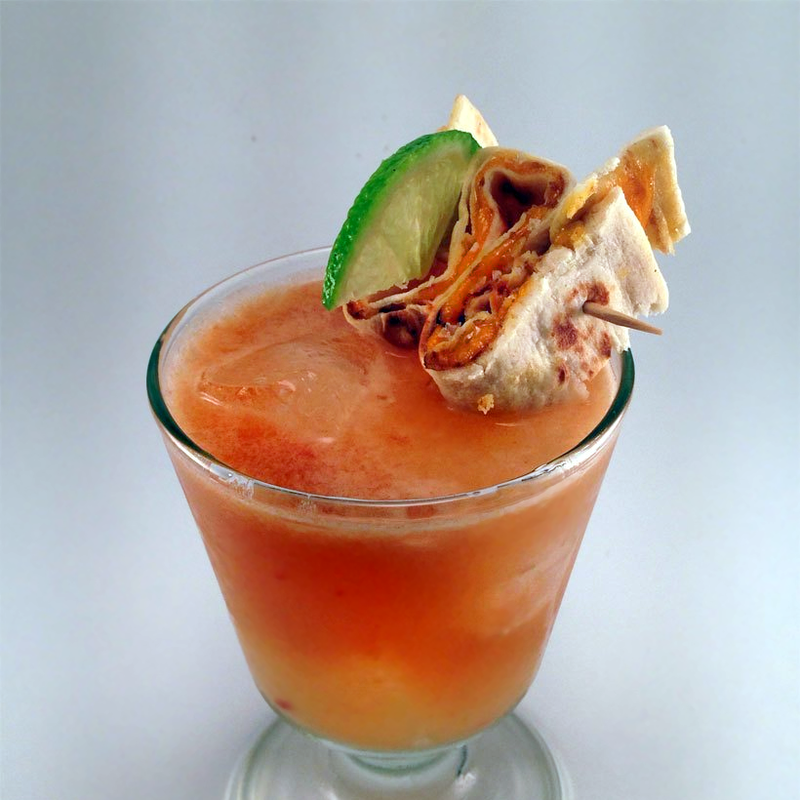 Garnish with a quesadilla, si se puede. To give this drink a more round tomato flavor, we used a medley of freshly juiced heirloom tomatos instead of sticking to one variety. If you don’t have any cumin syrup on-hand, or don’t feel like going through the trouble of making a batch, you can mix a pinch of cumin with simple syrup, to taste, and achieve a similar flavor. The bit of chili garlic was some last-minute serendipity, as I happened to have a bottle of Huy Fong in the fridge at the time. Serving this sort of drink over ice helps to cut down on the tomato juice’s heavy viscosity, making it easier to enjoy. I’ve also found that using a smokey spirit, like mezcal, helps to distract you from the fact that you’re drinking tomato juice. That, or using teas also works well with tomato drinks. This bloody mary was so tasty that we ended up mixing another at the end of the night, but, the second time we made it, it did have that “spiced salsa” quality to it, so we’ve adjusted the amount of chili garlic sauce for our final recipe, presented above. This is the last bloody mary drink for a long while. Lo sentimos. 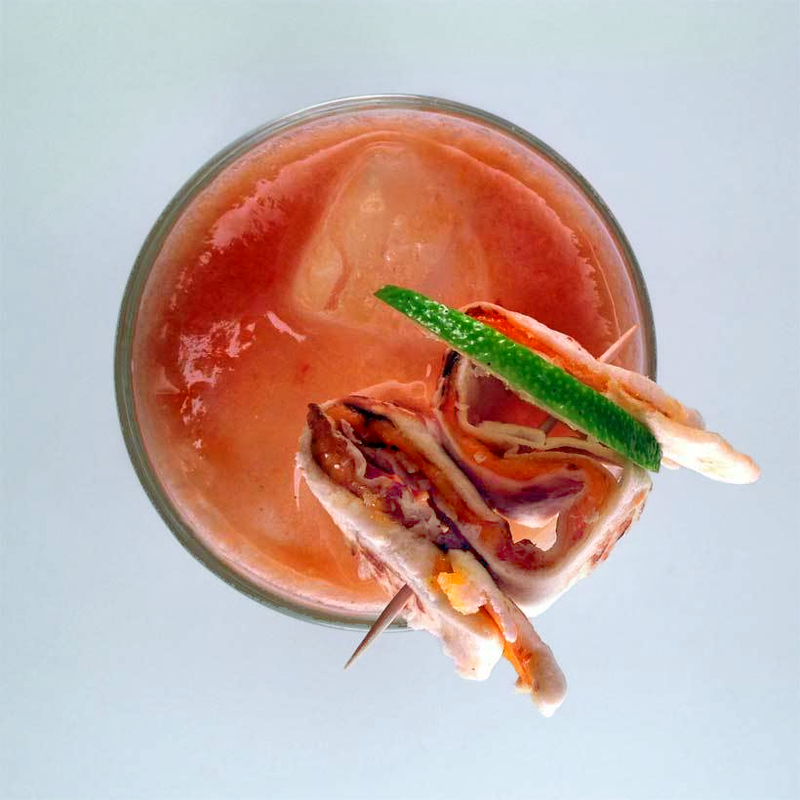 Categories: classics, modern drinks, original creations | Tags: alcohol, bartending, bloody mary, booze, chili garlic sauce, cocktail, cocktails, craft cocktails, cumin, cumin syrup, drinking, drinks, huy fong, lime, lime juice, liquor, mezcal, mixology, tomato, tomato juice | Permalink. I commend your efforts, here in the deep south tomatoes are a major icon, but I hate them whole or raw. Fresh romo tomato juice can be so sweet and tangy. While canned can have a savory salty spice. I think there can be room for all these flavors, and I think Mezcal was a great choice for pairing. I’ll look forward to trying this. Oh, but I don’t think I’ll be tomato tiki’ing anytime soon.